British author Andrea Levy, whose award-winning novels captured the black British experience in the years after Windrush, has died at the age of 62. A statement released on behalf of her family said she died of cancer. Levy was born in 1956 to Jamaican parents who had travelled to England on the Empire Windrush in 1948. 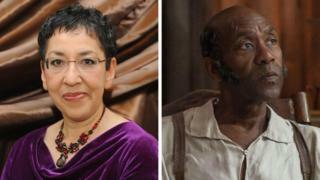 Sir Lenny Henry, who played a slave in the BBC adaptation of her novel The Long Song, said he had "loved hanging out with this pugnacious woman". Levy was best known for Small Island, about two Jamaicans who came to England after World War Two, and The Long Song, her last novel. The 2010 novel was nominated for the Booker Prize and was adapted by BBC One last year. Unlike her other four novels, The Long Song was not set in post-war Britain but reached back to early 19th Century Jamaica during the last years of slavery. Sir Lenny wrote in a tribute: "She was funny, had attitude and was immensely smart." Her publisher Headline said it was "hugely saddened" by her death on 14 February, adding that she "had been ill for some time". The poet Benjamin Zephaniah said of Levy: "In the future if anybody wants to have a look at how the Windrush generation arrived here and how we the sons and daughters of the Windrush generation survived and are surviving, they have to refer to Andrea's work ." Actress and director Kathy Burke said Levy was "such a great writer" and that The Long Song had been "the best thing on telly last Christmas". Levy did not start writing until she was in her mid-30s, after enrolling in a creative writing class at an adult education college in London. In 1994 she published her first novel, Every Light in the House Burnin′, a semi-autobiographical look at a young woman growing up in north London in the 1960s. Before that, little had been written about the lives of Jamaican immigrants and their families. It was not until the release of Small Island in 2004 that her writing really took off, with her fourth novel earning her the Whitbread Book of the Year, the Orange Prize and the Commonwealth Writers' Prize. The novel was praised for its compelling, intertwined tales of Jamaicans who moved from their own small island to Britain, and the Britons in whose home they lodged. Writing on Twitter, playwright and commentator Bonnie Greer recalled being sent a copy of Small Island to review and recognising it as "a masterpiece". Small Island was adapted for a 2009 BBC TV series starring Naomie Harris and Ruth Wilson. A stage version opens at the National Theatre in April. Rufus Norris, the theatre's director, said "her humour, craft, rigour, openness and clarity of thought" had been "a pleasure and a privilege to witness." Levy's final work was Six Stories and an Essay, a collection of short stories she had written during her career and an essay about her Caribbean heritage. It was published in 2014. She was also the subject of an episode of Alan Yentob's series Imagine in December, which profiled her career and her contribution to literature in Britain. Jane Morpeth, Levy's editor at Headline, said she was "incredibly honoured to be Andrea's publisher and to call her my friend". "Her legacy is unique, and her voice will be heard for generations to come," she continued.